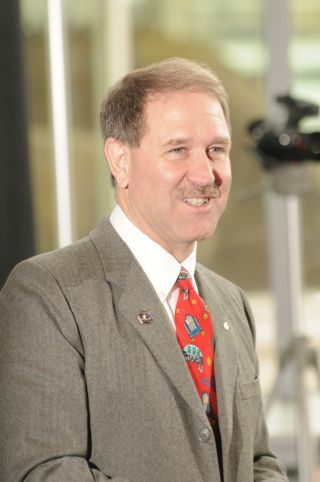 Physicist and former astronaut John Grunsfeld has been named NASA's new Associate Administrator for the Science Mission Directorate at the agency's headquarters in Washington, D.C. Grunsfeld succeeds Ed Weiler, who retired from NASA on Sept. 30, 2011. WASHINGTON — Physicist John Grunsfeld will take over as head of NASA’s Science Mission Directorate effective Jan. 4, putting the former astronaut and Hubble Space Telescope repairman in charge of the agency’s $5.1 billion science budget. NASA announced Grunsfeld’s appointment in a Dec. 19 press release. He will be responsible for NASA’s astrophysics, Earth science, heliophysics and planetary science programs. Grunsfeld has a doctorate degree in physics from the University of Chicago and was a research scientist specializing in x-ray and gamma-ray astronomy before joining the NASA astronaut corps in 1992. He has flown five space shuttle missions, including a 10-day mission to the Russian space station Mir and three separate Hubble servicing missions. Grunsfeld succeeds Ed Weiler, who resignedfrom his position in September after 32 years with NASA. Grunsfeld is scheduled to take over as associate administrator for the Science Mission Directorate two years after leaving the agency to become deputy director of the Space Telescope Science Institute in Baltimore. The Space Telescope Science Institute runs the Hubble telescope’s science program and will also operate the $8.8 billion James Webb Space Telescope (JWST) in space, assuming the troubled project can be completed according to the revised schedule and budget NASA has put forward this year. JWST is now slated to launch in October 2018.